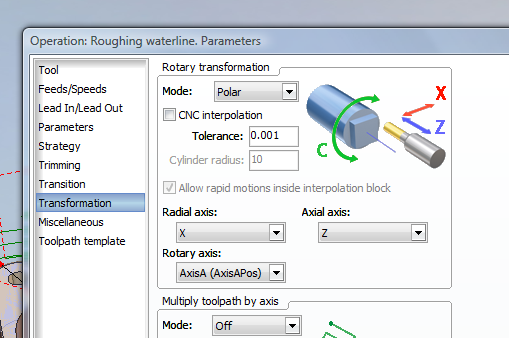 I�m a new Sprutcam user and wondering can anyone show me how to set the rotary table in the �C� axis. I have included a sample model that maybe someone can annotate. I�m having a hard time with this manual trying to understand it. Hi Chris, welcome to the Sprutcam forum. I have moved your post here as it is the most appropriate section. Attached is a machine configuration (without images) which should work for what you need. I have kept the rotary axis denoted as the A axis instead of C so that you should be able to use the standard Tormach postprocessor. To use this you need to unzip the folder to your C:\ProgramData\Sprut Technology\SprutCAM\Version 7\Machines\CustomSchemas folder (Vista / Windows 7). Then run SprutCAM 7, in Machining mode double left click the current machine, then select the 'Machines' tab, select 'Machines library', select 'Load' icon (Load machine file to full machine list), select 'CustomSchemas', select 'Tormach2' select 'Tormach2.xml' click 'Open'. Now click the green + button and select Ok. Select Tormach2 from the machine list and you are done. This configuration doesn't currently include images of the machine but should do what you require. You can still select the 'Machine visibility' button to aid simulation. First of all thanks for the response. The path you asked me to unzip these files to doesn�t exist on my setup. C:\ProgramData\Sprut Technology\SprutCAM\Version 7\Machines\CustomSchemas folder. C:\Program files\Sprut Technology\Sprutcam7\Supplement\Machines. And under machines folder there is Abstractmachine, Initialmachinelist,machinesConfig,Machine Types. I have the software setup on windows 7 and windows XP. Both paths are the same. I don�t have a path called C:\ProgramData. Maybe I�m missing something? I think that by default 'ProgramData' is invisible, you'll have to make it visible: Vista: Organise - Folder and search options - View - Show hidden files and folders. Thanks mate, I was able to find the correct directory and have created Tormach2. From what I can tell it seems to work fine, I will post this and see if the �c� axis is doing what I think it should. I know you said this doesn�t include images and should be able to run the machine simulation. Please see attached screen shot as the machine is somewhat disjointed. I don�t want you to fix this for me but maybe give me some clues you have already done enough. I was a Visual mill user and decided to switch due to cost and functionality and this feature was one function that Visual Mill can not do. But between you and me I�m having a hard time following the manual. The machine (attachment) has been modified to remove the images instead of using the default visibility off. I posted the file as mentioned, and no �C�/rotary movement at all. I have previously cut the part not using the rotary table �3 axis movement� just to get used to the software. The only reason I wanted this feature is because the �X� axis has more travel than the �Y� axis. So to somewhat extend the limits and the ability of the machine I thought that if I was able to utilize the �C� axis that would account for the shorter �Y� travel. Have you enabled 'Rotary transformation'? My fault I forgot to enable this. Still no luck. I have enabled 'Rotary transformation' and the simulation indicates it's working properly (Machine Simulation turned on ). When I post the file I still get no rotary motion. Just thought I would let you know the guys at Tormach are looking at this as when I ran the post the machine wasn�t very happy.